NANJING, China, July 11th, 2018 --- The 2018 China Sustainable Palm Oil Supply Chain Forum & The Second RSPO China Forum (the Forum) was held today in Nanjing, China. The China Sustainable Palm Oil Alliance (the Alliance) was jointly launched by the Roundtable for Sustainable Palm Oil (RSPO), China Chamber of Commerce of Foodstuffs and Native Produce (CFNA) and World Wildlife Fund (WWF) to create a platform for win-win cooperation among the stakeholders in the palm oil supply chain and promote sustainable palm oil in China. 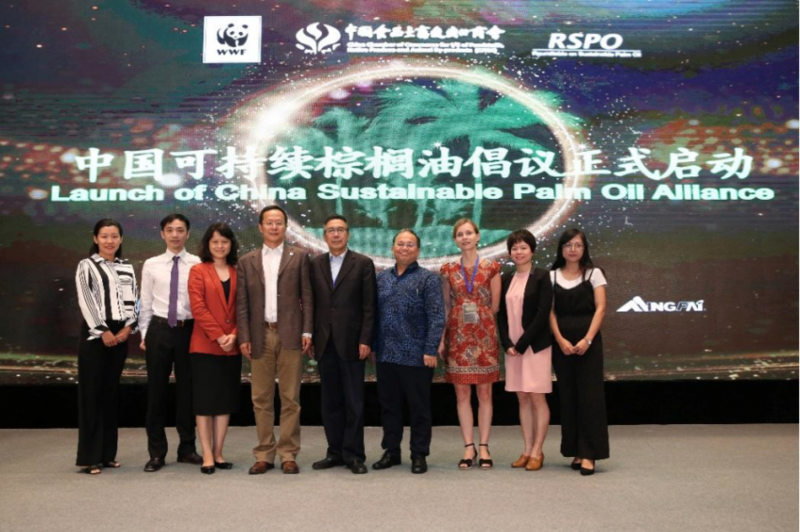 Representatives from the three parties attended the launch ceremony for the Alliance, including RSPO CEO Datuk Darrel Webber, President of CFNA Mr. Bian Zhenhu and Mr. Zhou Fei, the Head of TRAFFIC China and the WWF’s wildlife trade programme. Key companies and stakeholders in the palm oil supply chain, such as Mars Wrigley Confectionery, L’Oréal China, AarhusKarlshamn (AAK), Cargill China, China National Cereals, Oils and Foodstuffs Corporation (COFCO), China Grain Reserves Corporation (Sinograin), HSBC, Yihai Karry, SGS China and more gathered at the Forum to make a joint commitment about taking step-by-step actions to promote the adoption of sustainable palm oil in China’s palm oil market. At the Forum, attendees held extensive discussions on topics such as “RSPO Members Promote Sustainable Palm Oil in China,” “Case Study: Supply Chain Management of Sustainable Palm Oil,” and more. China is the second-largest importer and third-largest consumer of palm oil, which is widely used in many different industries and plays a significant role in ensuring China’s grain and food security. At present, RSPO has more than 3,900 members worldwide, coming from 92 countries and representing all links along the palm oil supply chain, among which 87 are from China with 73 RSPO-certified facilities. RSPO is seeing very positive momentum towards its vision for China to achieve 10% CSPO uptake by 2020. Chinese membership in the RSPO has surged in the past few years, demonstrating how Chinese companies in the supply chain are engaged in an ongoing, dynamic process of transformation that will strengthen China’s global stature in the palm oil industry. The launch of the Alliance by the RSPO, WWF and CFNA will not only heighten awareness among key stakeholders about the RSPO and the value of driving sustainability in the palm oil industry, but also encourage more Chinese companies to participate in transforming global markets to make sustainable palm oil the norm. The Roundtable on Sustainable Palm Oil (RSPO) was formed in 2004 with the objective of promoting the growth and use of sustainable oil palm products through credible global standards and engagement of stakeholders. The seat of the association is in Zurich, Switzerland, while the Secretariat is based in Kuala Lumpur with satellite offices in Jakarta, London, Zoetermeer (NL) and New York. RSPO is a not-for-profit association that unites stakeholders from seven sectors of the palm oil industry - oil palm growers, palm oil processors or traders, consumer goods manufacturers, retailers, banks and investors, environmental or nature conservation NGOs and social or developmental NGOs to develop and implement global standards for sustainable palm oil. For more information, please visit RSPO’s global website www.rspo.org or the RSPO’s Chinese website www.china.rspo.org.